If a dangerously inbred puma population in Southern California is to survive in the future, an urgent need for genetic connectivity must be met, according to two scientific papers from a team of researchers coordinated by the University of California, Davis, and involving scientists at the University of Wyoming and the University of Massachusetts–Amherst. The first paper, published in the journal Royal Society Open Science in May, reports that the puma population of about 20 adults in the Santa Ana Mountains has the lowest genetic diversity ever reported for pumas besides the Florida panther, which nearly went extinct from genetic causes. The pumas’ isolation is primarily due to surrounding urbanization from Los Angeles and San Diego. 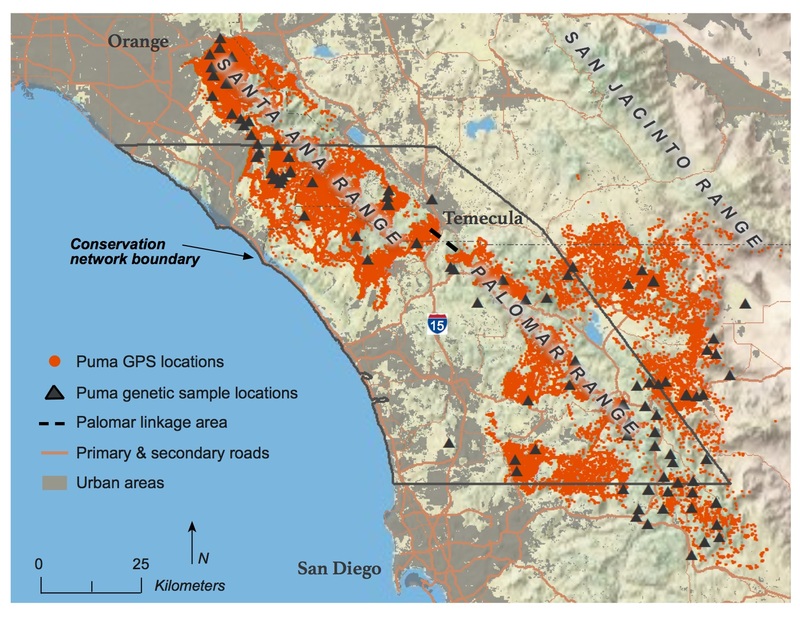 “The only hope for puma movements in and out of the Santa Ana Mountains is to cross I-15 — an eight- to 10-lane interstate highway — which poses a major barrier for pumas attempting to migrate between the Santa Ana Mountains and the rural Eastern Peninsular Mountains,” said lead author Kyle Gustafson, a postdoctoral conservation geneticist from the University of Wyoming. University of Wyoming researchers conducted genetic analyses of both radiocollared and uncollared pumas to develop a multigeneration pedigree. This showed where pumas and their offspring were born, and whether they successfully migrated and reproduced after crossing I-15, which separates the Santa Ana Mountains from other mountain ranges to the east. Although seven males crossed I-15 over the past 20 years, only one — male puma #86 (M86) — was able to successfully produce offspring in the Santa Anas after migrating from the genetically diverse population to the east. By producing a total of 11 detected offspring, M86 rapidly disseminated unique genes into the inbred population, which reduced the level of inbreeding and significantly increased genetic diversity. Unfortunately, M86 was hit by a car between 2014 and 2015, and more than half of his offspring are either now deceased or in captivity. The second paper, published this week in the journal PLOS ONE, provides a potential solution to this issue. In it, the researchers propose a conservation network for pumas spanning the Santa Ana Mountains and the Eastern Peninsular Mountains. Using genetic data and data from GPS radio-collared pumas, this analysis identified critical habitat patches, movement corridors, and key road crossing locations across I-15 that would allow pumas to persist and increase genetic diversity. “Without continued emigration into the Santa Ana Mountains by pumas coming from the east of I-15, eroding genetic diversity and continued inbreeding are expected to resume,” said veterinarian Walter Boyce, co-director of the Wildlife Health Center’s Southern California Mountain Lion Study with Vickers. 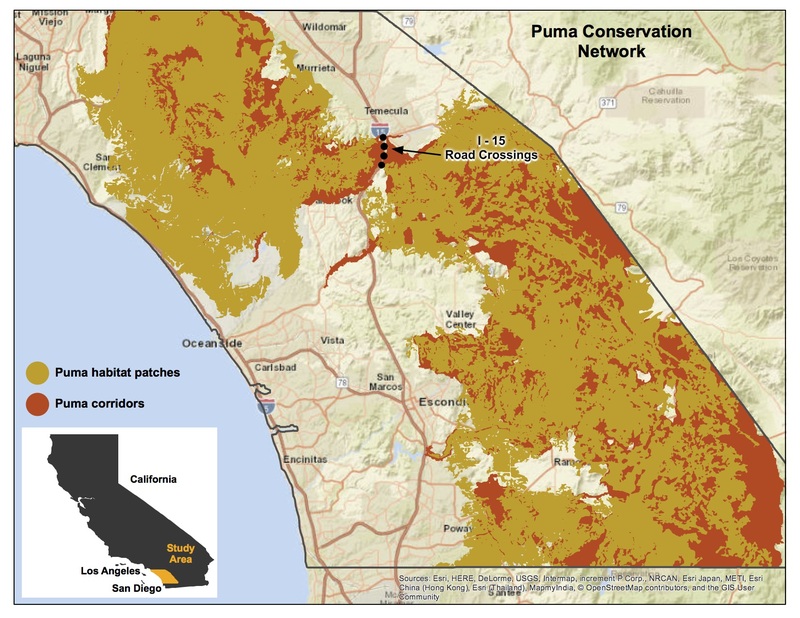 Protected areas in Southern California currently cover about 50 percent of this proposed puma conservation network. Incorporating key new areas in Orange, Riverside and San Diego counties would increase the protected areas to nearly 80 percent. Habitat protection, coupled with wildlife crossing structures and wildlife fencing, will be needed to promote the safe passage of pumas across I-15 and ensure adequate gene flow. “The current protected area system is not enough to ensure the survival of pumas in Southern California,” said lead author Katherine Zeller, a wildlife biologist at the University of Massachusetts-Amherst. “Without additional avenues for pumas to move safely between large habitat blocks, these populations will continue to see decreased gene flow, as well as high mortality rates, which will decrease their chances of long-term survival in the region. Primary financial support for the research was provided by the San Diego County Association of Governments, and the California Department of Fish and Wildlife. The studies required partnerships across research institutions and state agencies to combine GPS and ecological data collected over 15 years by researchers from the UC Davis Southern California Mountain Lion Study with analysis of genetic, habitat use, and movement data by researchers at the University of Wyoming and University of Massachusetts-Amherst.